Almost 500 merchants lay down their goods here every day of the year. It’s practically the only reason people come to the Marolles area. Most of the stuff sold here would qualify as junk but if you look hard enough you can find some real treasures. The range of wares covers antiques, furniture, books, vintage clothes, jewellery, interior decor, art, shoes, statues, metalwork - it’s a completely hodgepodge collection. No matter what you find the rowdy and bustling atmosphere alone is worth visiting for. Come early morning on the weekends for the best finds. And though you can bargain a little the prices are already quite low. Don’t negotiate prices too hard at the flea market. Trams 3, 4, 32 stop Lemonnier. Trams 2, 6 stop Louise. How popular is Marolles Flea Market? People normally club together Cinquantenaire and Musee Rene Magritte while planning their visit to Marolles Flea Market. 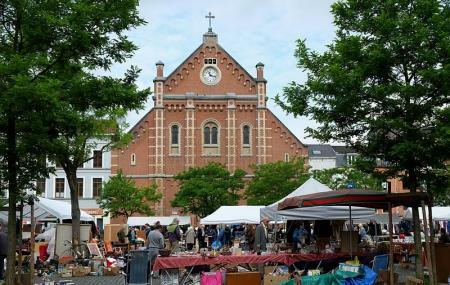 People also prefer to start their day with Marolles Flea Market. Very nice place if you are a art collector... Come prepared to buy many stuff. This place is very near from Zuid Metro station where there is another fruits and vegetables market with many food stalls. You can visit both these markets at one go. Note that market closes at 2pm on Sunday. It's a vintage market. You can find almost anything there. But we thought that it was very much over priced. But it was nice just to take the atmosphere in. I had to pick through and see what the 1 star reviews said: "Nothing to buy there and pretty chaotic." "Do t understand any of the other posts or why it gets 4 stars. A mish-mash of complete garbage that mostly belongs in the dumpster." "Lots of junk" "I have not seen worse things for sale. And from the rubbish they have gutted" THIS IS THE EXACT DESCRIPTION OF AN AWESOME FLEA MARKET. Do spend some time here, extremely eclectic and things from all over, not just Belgium/Brussels. "How much is this?" "5 Euro" "How about 3?" "Ok" This is a great flea market some days it works and there's lots of interesting things, other days, that really cool thing you saw isn't there. Spend a few days visiting this, very worth it. Everything from a space heater that probably works to glassware that you won't find anywhere else.